Sample Sale time! 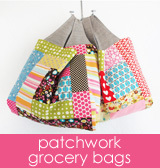 Today this colorful patchwork pouch is available as a sample. Sold - thank you! 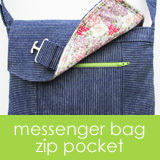 There isn't a pattern for this pouch, but this pattern shows how to make a similar pouch. This is 8.25" wide x 4" high and has a 7" zipper opening. The patchwork is pieced to flannel. The back side is lightweight denim. It's lined in a pink stripe print fabric from Riley Blake. The lining fabric is lightly quilted to canvas. This is the extra large version of the Grocery Bag made from denim and Garden of Dreams from Amy Sinibaldi's Charleston collection for Art Gallery. This bag is available as a sample today. Sold - thanks! There's a small stack of recently finished projects just waiting to shared with the world and I thought I'd start with this bag because it turned out so lovely! 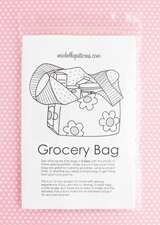 This is the medium Grocery Bag, but with the body pieces divided into two fabrics. The quilting cotton fabric is a print called Carry My Soul from the Rosa collection and it really is so very, very pretty. Needless to say, I want them all! Another barkcloth zipper pouch is available in my etsy shop here.